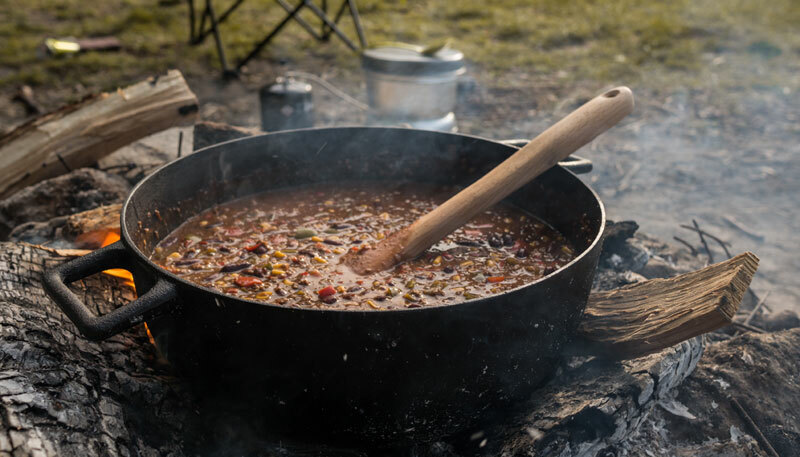 Camping and hunting seasons will be here before we know it, and venison chili cooked over the campfire is the perfect way to let out your inner cowboy. An easy, powerfully good tasting, filling meal after a long day in deer country is tough to beat, and Paul Doty, of New York, has perfected this venison chili recipe. With the fire crackling and the Dutch oven brewing in the background, the night is clear and the moon is out, you can kick back and imagine yourself out on the wide-open Old West. So, grab yourself some grub pardner, kick off your boots, and relish the venison chili recipe that any ol’ cowboy would dream of. These instructions are for making at fireside when camping out or on the trail. The spices should be combined at home and carried in a can or plastic bag, the lard and garlic should be packaged separately. You can make chili powder from scratch by mixing ground cayenne, oregano, cumin and salt in a 3:2:1:1 ratio. Use a Dutch oven, 3-quart size or better, nestled in a generous bed of coals. It’s easiest if the supply fire is a couple feet away, giving you a chance to work over the pot, adding fresh coals to the cooking area as needed. Brown the meat in the lard, half at a time. With a large slotted spoon set the browned meat aside, adding more lard as necessary. After all the meat is well browned, pour off any extra grease. Combine the meat, chili powder and all the spices. Dice and add the garlic. Stir the meat vigorously, coating each piece with the spices, and continue cooking over lower heat for 10 to 12 minutes. It may be necessary to remove the kettle from the coals to prevent burning, but the heat of the pot should be sufficient to allow the herbs and peppers to soften and blend. Add enough water to cover the meat. Return to the fire with enough coals to bring the chili to a boil. Cover and simmer, stirring occasionally, for one hour. Grate or chop the onions finely and add to the chili. Continue cooking for an additional hour, adding more water as necessary until the onion dissolves. Allow the chili to stand for 10 minutes before serving, skimming off any fat that rises to the top. 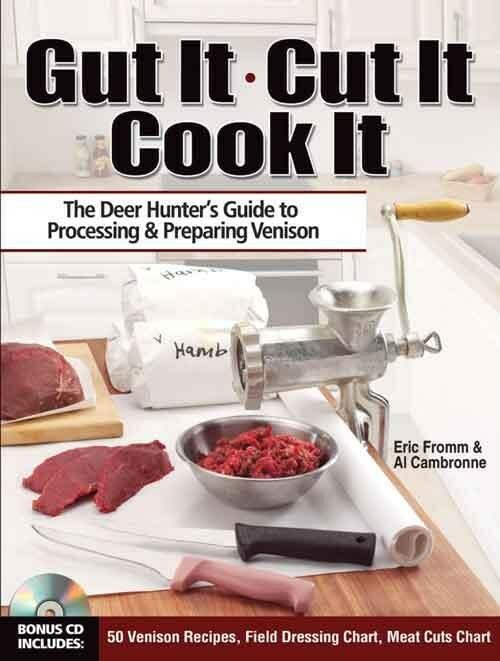 For more outstanding step-by-step tips on cleaning, processing and preparing your own venison just like these, check out Gut It. Cut It. Cook It. by Eric Fromm and Al Cambronne, available now at ShopDeerHunting.com. Relive episodes of the best deer show on TV! Pressure, or Playing the Hot Hand? Find out what hunting pressure does to your odds of tagging out. Read Deer & Deer Hunting on the Nook! Read the current issue or subscribe today. Watch your favorite deer hunting shows for free. Best deer hunting gear deals. Read all about it: from preparing for the hunt to cooking the kill! Providing daily lunar charting, activity dates and tending phases.